This chapter outlines how health professionals may best prevent, recognize, assess, manage, and support people with palliative diagnoses who are at risk of delirium and their families, according to best evidence and the circumstances, needs, and wishes of the person. 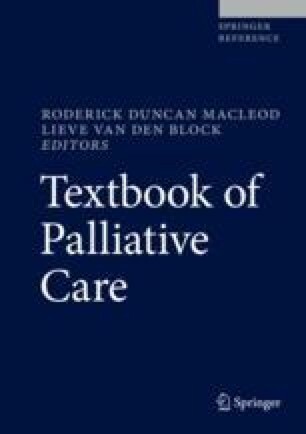 The chapter also presents evidence-practice gaps in delirium care in palliative contexts and briefly outlines future directions for research and clinical practice development. Australian Commission on Quality and Safety of Healthcare. Safe and high-quality care for patients with cognitive impairment. 2015 [cited 4th Jun 2015]; Available from: http://www.safetyandquality.gov.au/our-work/cognitive-impairment/. Australian Commission on Quality and Safety of Healthcare. Delirium Clinical Care Standard. 2017 [cited 20 Mar 2017]; Available from: https://www.safetyandquality.gov.au/our-work/clinical-care-standards/delirium-clinical-care-standard/. Beller EM, et al. Palliative pharmacological sedation for terminally ill adults. Cochrane Database Syst Rev. 2015;1:CD010206. https://doi.org/10.1002/14651858.CD010206.pub2. Boodman SG. The overlooked danger of delirium in hospitals. 2015. TheAtlantic.com. Hospital Elder Life Program. Confusion Assessment Method (Short CAM). 2015 [cited 24 May 2015]; Available from: http://www.hospitalelderlifeprogram.org/delirium-instruments/short-cam/. Lonergan E, Luxenberg J, Areosa Sastre A. Benzodiazepines for delirium. Cochrane Database Syst Rev. 2009. https://doi.org/10.1002/14651858.CD006379.pub3. McLullich, A. The 4AT – a rapid assessment test for delirium. 2014 [cited 18 Mar 2015]; Available from: http://www.the4at.com/. National Clinical Guideline Centre for Acute and Chronic Conditions. Delirium: diagnosis, prevention and management, NICE clinical guideline 103. 2010. Available from: https://www.nice.org.uk/guidance/cg103. Palliative Care Outcomes Collaborative. 2014 [cited 19 May 2015]; Available from: http://ahsri.uow.edu.au/pcoc/about/index.html. Siddiqi N, et al. Interventions for preventing delirium in hospitalised non-ICU patients. Cochrane Database Syst Rev. 2016;11(3):CD005563. https://doi.org/10.1002/14651858.CD005563.pub3. Teodorczuk A, et al. Patient experience of delirium – teaching video. 2011. 27 Jun 2014 Available from: http://www.europeandeliriumassociation.com/delirium-information/health-professionals/patient-experience-of-delirium-teaching-video/.